In this modern day, it is possible to conduct a meeting with other people around the globe on the web. 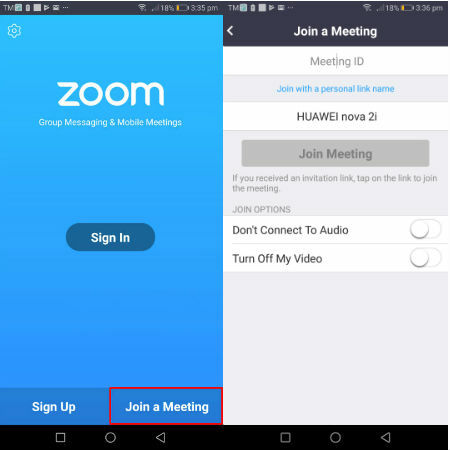 One tool that can help you join or create an online meeting is Zoom. This software is available on computer and mobile phones; thus, you can access it and attend a meeting on any device. However, it does not have a built-in recorder that will allow you to capture your entire conversation. So rather than taking notes to remember all the important details while you’re discussing, why not record Zoom meeting to save yourself from inconvenience? Scroll down to find the best recorders that will suit your needs. 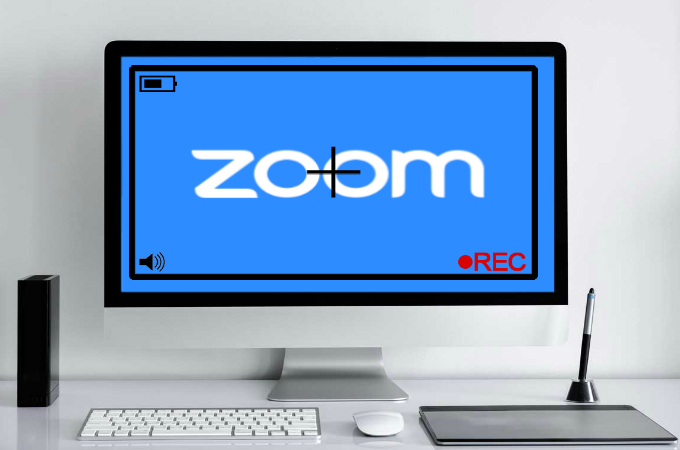 This first program you can use to record zoom meetings is ApowerRec. 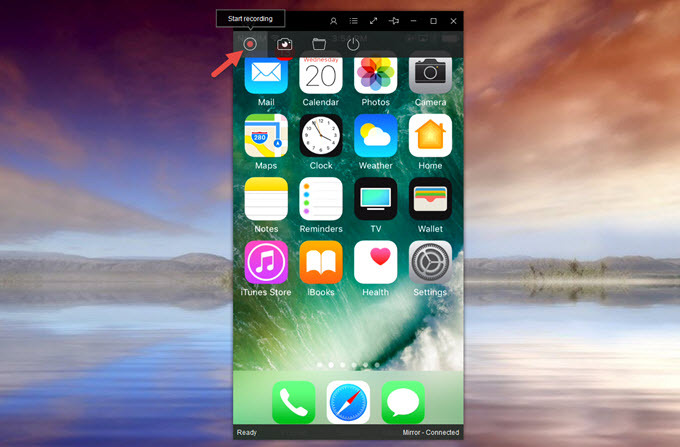 This is a powerful screen recording application for Mac and Windows. ApowerRec is the ideal program to record online webinars or conferences, since it can capture your display with audio from your system, microphone, or both with no time or other limits. In addition, it has several recording modes such as only audio, custom region, full screen, and schedule recording, etc. Moreover, it can also be used to take screenshots and annotate recordings. Aside from that, it can help you create smooth and high-quality footage with no watermark. Now, if you want to use this program to record your zoom meetings, you may follow the steps below. On your web browser, go to the main page of Zoom. Navigate to “Join a Meeting” then enter your Meeting ID or Personal Link Name. Once you’re in the meeting, launch ApowerRec then start recording by clicking the “Rec” button. While recording, you can add annotations, shapes, arrows, and lines, etc. If you want to stop recording your meeting, simply hit the “Stop” button. Then your recorded file will be saved automatically and will be shown on the ApowerREC file list. Have ApowerRec installed on your computer. Open your web browser and visit the main page of Google to sign in to your Gmail account. Next, locate and select your e-mail invitation. After that, hit the link that invites you to join a Zoom meeting using your PC. Then a zip file will automatically be downloaded in your pc. Once downloaded, install the file on your computer. Then, click the zoom launcher. A pop-up window will appear indicating the time of the meeting. If the host has already started the conference, you will be automatically connected. Once connected, you can start to record it. Simply launch ApowerRec, then hit the “Rec” button to initiate the recording process. Upon recording, you will have an option to add annotations and figures to highlight a significant text or image. To end the recording, simply click on the “Stop” icon. You can view your recorded video on the file list of this program. 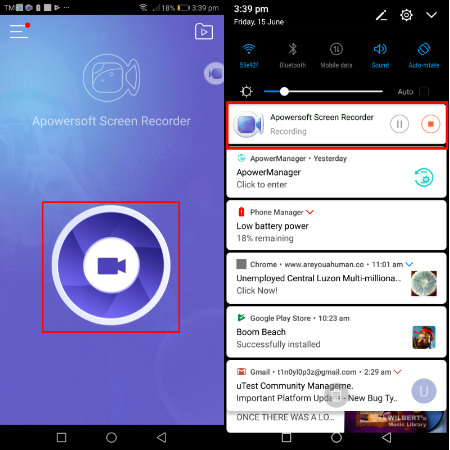 Apowersoft iPhone/iPad Recorder is a screen recorder that has a screen mirroring function. With this app, you can cast and record your iOS screen in real time wirelessly. Plus, it doesn’t require phone jailbreak unlike others. Upon using it, you will have access to various output formats such as MP4, WMV, GIF, AVI, FLV, MPEG, and VOB. Furthermore, it supports iOS 7 and later. If you want to learn how to record zoom meetings with this app, simply follow the instructions below. First, download and install Apowersoft iPhone/iPad Recorder on your PC. Once installed, launch the app. Then connect your iOS device and your PC to the same WiFi network. 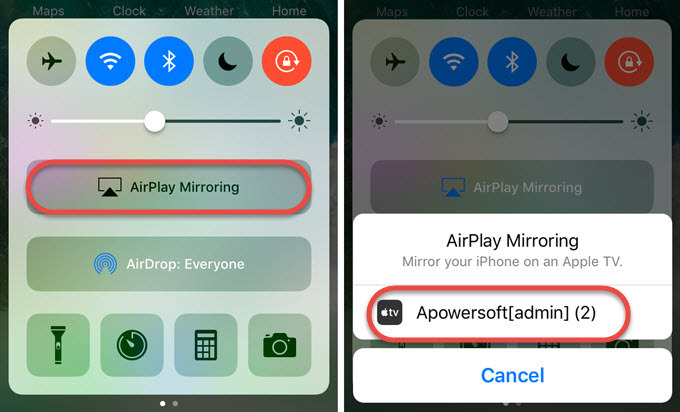 On your iPhone/iPad, swipe up from the bottom of your screen to launch its control center and tap “Screen Mirroring” or “Airplay Mirroring” and then select the device displaying the name of your PC. Then your iPhone/iPad screen will be streamed onto your PC. Once connected, launch your Zoom Cloud Meeting app. 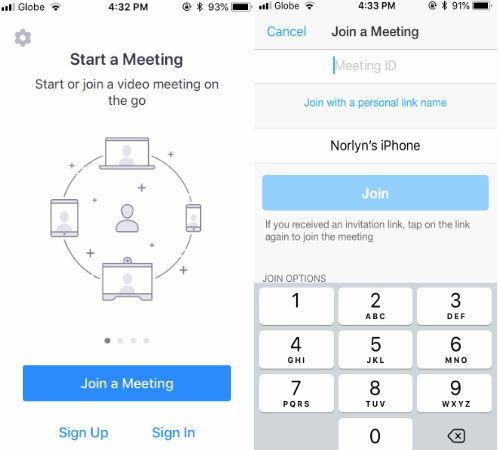 If you already have a scheduled meeting, select “Join Meeting”, and then enter your Meeting ID (can be obtained from the host of the meeting). Meanwhile, choose “Schedule or Host a Meeting” if you are going to create your own meeting. Now, from your desktop, hit the “Record” button located at the upper left of your interface. Then the Zoom meeting on your iPhone will be recorded. If you want to stop the app from recording, you can click the “Stop” icon from the same spot. Upon stopping your recording, your output will automatically pop up. To record your Android’s screen without any difficulties, you can use Apowersoft Screen Recorder. This is a reliable screen recording app for Android devices. It can help you capture your screen activity with audio coming from your device. Moreover, it comes with a comprehensive and clean interface. This program is perfect when you want to record your meetings or gameplay in high-quality. Additionally, it does not require one to root his or her device before getting the app to work. To make a zoom video conference recording using this app, you can follow these guidelines. To begin, open your Google Play Store then search and install Apowersoft Screen Recorder. Or you can download it by clicking the button below. After that, launch your Zoom Cloud Meeting app. Now, tap “Join Meeting” and input your Meeting ID to enter an existing or scheduled meeting. If you are going to be the host and schedule a meeting, tap “Schedule or Host a Meeting”. When the meeting is about to start, launch Apowersoft Screen Recorder and then tap the video camera icon to start recording. There will be a window pop-up showing this app will start to capture your screen activities, just tap on “Start Now” to continue. If you want to stop recording the Zoom meeting, simply swipe down your screen to launch your drop down notification bar and then click the “Stop” button to end it. Then your recorded files will be automatically saved, and you can check it immediately. Note: To record the internal sound or the sound from the other parties successfully, you need to use the speaker as your audio input instead of the microphone. Actually, there are a lot of programs available for you to capture your Zoom meetings. If you want to record without complication, you can use the aforementioned Zoom recording software. These programs are convenient and reliable, which can help you make a fluent and high-quality Zoom meeting recording.